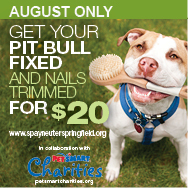 Pit Bull Spay/Neuter $20 in August!!! Have you been putting off having your Pit spayed or neutered? Spay your Pit mix for $20! Call and reserve your appointment today! Feel free to ask questions that could help you decide why or why not to fix your dog. Spaying and neutering is a necessity in our area, but responsible breeding can be important too. Can Fighting Pits Really be Rehabilitated? Anonymous Question: Can a Pit Bull that has been trained to fight really be rehabilitated to be a good member of a family? I'm not sure how I really feel about the word rehabilitate. A very respected colleague, behaviorist, and friend of mine made a comment to me about puppy mill dogs the other day. A friend of ours told us she was taking a dog halfway across the US to have him rehabilitated. "He is scared of everything", our friend said, "This place is going to rehabilitate him". After that conversation, my colleague said to me, "Is it really rehabilitation if the dog was never allowed to or taught to handle life the correct way"? That was an awesome point, and it got my dog obsessed mind thinking. 1. Restore (someone) to healthy or normal life by training or therapy after imprisonment, addiction, or illness. 2. Restore (someone) to former privileges or reputation after a period of critical or official disfavor. 1. They are loyal to such an extreme that they will fight and kill another animal when a human tells them to. 2. 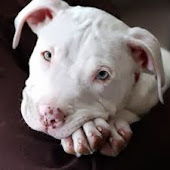 Professional fighters will inhumanely euthanize Pit Bulls that show any kind of human aggression. 1.They are loyal enough to learn how to act appropriately just so they can be loved. 2.They are very rarely human aggressive, genetically. 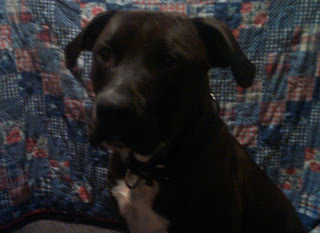 Every time I foster a Pit Bull that has obviously been fought it amazes me how eager they are to learn new things. It is heartwarming to watch them slowly find that they don't have to watch their back every time they are taken out of the kennel. You can actually see them relax more each day as they realize they don't have to defend themselves anymore. They find that they love toys, kids, being fed regularly, sleeping on the couch, and even having other animal friends. Some love their new lives so much I have seen them become therapy and service dogs. Of course, there are always the few that are so defensive they can't learn to live with other animals, but they can still do great in single pet homes. The amount of dogs I have successfully trained and taught to modify the way they handle life...(rehabilitated)...is great in comparison to those that were just too far gone to help. Some dogs are just so emotionally scared on the inside, that the scars on the outside can only begin to tell their story. After spending time teaching a fighting Pit Bull how great life really can be, and watching their personalities emerge, it always hurts my heart to let them go to their forever homes. It's bitter sweet. I am an important stepping stone that teaches them to live, yet I know they will soon realize the person I left them with will love them just the same as me. This is Rocky, my most recent foster. He has many scars on the outside that will never go away, but humanity is teaching him that the scars on the inside can heal with time and love.  Implement a comprehensive pet licensure program for dogs and a voluntary licensing for cats- This approach would be modeled after ordinances in many cities, including Salt Lake City, Omaha, and Calgary. Responsible pet ownership revolves around the proper care and identification of an animal and preventing pets from becoming a hazard or nuisance to the community. o Goal: To promote the philosophy of responsible pet ownership.  We recommend a differential licensure approach where the licensing fees are significantly less for animals that have been spayed/neutered. There has also been suggestions of a free ride home for a first offence with a dog at large, and a coupon booklet with discounts from area businesses. Sounds like it would be cheaper to license all four of my dogs than it would be to license my two Pit Bulls. What have those of us with Pit Bulls X's have to loose? And how many people with any breed would feel better if your dog would have every chance of making it's way back home if lost? How many of you know if your current microchips have to be renewed every year? Very few places give out lifetime microchips. What if this mandatory licensure could keep you microchip valid for the life of you dog? Food for Thought...An questions or comments?